Umlambo Wobomi /River Of Life is an African fairy tale about a rural tribe and their special princess Mamlambo, who all live by a beautiful river full of magical creatures. Set in an idyllic rural village where people live and work with nature and whose local river provides for their every need, River Of Life is a story of disconnection in a changing world. With her community in crisis, Mamlambo finds the courage to travel a path alone. She faces a hot dry desert, a teaming jungle and climbs the tallest mountain, all to find the Sangoma, save the river and her village. Umlambo Wobomi /River Of Life is a musical, physical, interactive production that takes learners on a journey of discovery beginning with water cycle and teaching about key issues such as water quality and pollution, water security and the important role that communities play in protecting this precious resource. 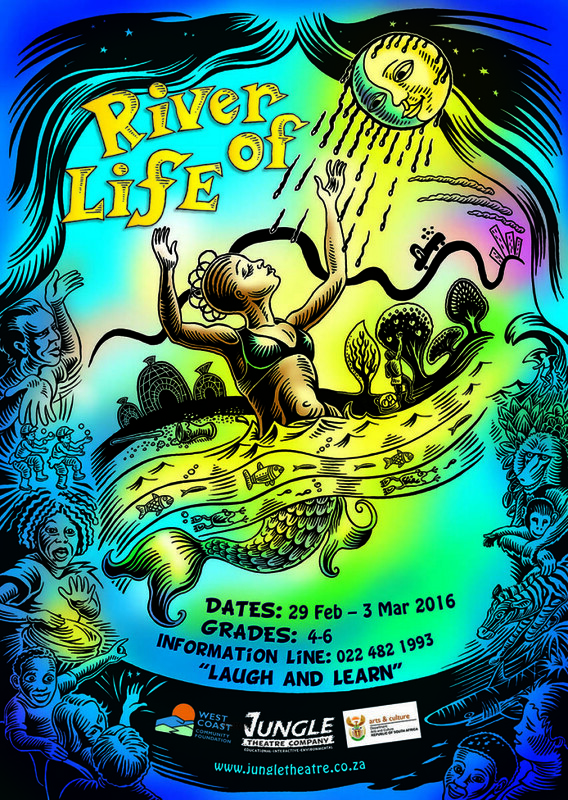 Umlambo Wobomi /River Of Life is 40 minutes in duration and is best suited for Grades 4 – 7. An accompanying workshop is also available. Umlambo Wobomi /River Of Life was the first production workshopped by the Laduma Jungle trainee team from Ocean View, Langa and Khayelitsha. Vincent Meyburgh directed the play with assistance from Nimray Kruger and Mfundo Hashe. It was first performed for the City of Cape Town’s National Water Week programme at Ratanga Junction in March 2011 and went onto two public run at the Masque Theatre in 2011 and 2012. It was part of the ASSITEJ SA Family Venue at the National Arts Festival in 2013, toured the West Coast Community at the start of March 2016 and was performed at the Masque Theatre during Water Week 2016.